Sliding Compound Miter Saws (SCMS) have been popular with contractors for years because of their accuracy, versatility and portability. These same qualities make the SCMS attractive to a growing number of home woodworkers faced with shrinking shop spaces that make other types of saws difficult to use. In recent years, SCMS design has evolved, bringing many updated features and even higher levels of precision. The brand new Bosch 4410 SCMS, a new version of their venerable 12" Model 4412, is the latest addition to their line of quality tools, and one that should be on your look-see list if a SCMS is in your future. The Bosch 4410 SCMS comes in a rather large box, primarily because it comes completely assembled except for the dust bag, chute and no-tools clamp. The saw is encased in form-fitting expanded bead shells that insure it arrives at your shop in perfect condition. The steps necessary to release the saw from its shipping configuration and check the setup are explained in the instruction manual, which should be read before going any further. I followed the setup steps carefully and found my Bosch 4410 SCMS had been adjusted perfectly at the factory, but it is worth your time to check and become familiar with this procedure. Tech-line advisors will tell you that most of the problems they encounter are directly attributable to users not reading or following the instructions provided. In the case of the Bosch 4410 SCMS , the manual is well done and contains a lot of good information that will help use this tool correctly and safely. Bosch includes tools you can actually use! Aside from clear descriptions of the various functions and controls, the manual provides easy-to-understand instructions on how to make many of the more common cuts. There are even charts listing the necessary angles and stock positions for cutting crown molding. You will want to keep this manual handy as reference material. The quality of the casting, machining and parts fit on the Bosch 4410 SCMS is first rate, as is typical of Bosch. Their manufacturing capabilities and practices consistently produce tools that work very well, and continue to function at that level for many years. Bosch has a habit of including high-quality tools necessary for adjusting and maintaining their equipment. Those supplied with the Bosch 4410 SCMS follow that tradition. A socket wrench with a reversible #2 Phillips screwdriver/4mm hex tip on the other end is secured in a rubber sleeve in the back of the fence. A pair of hex wrenches (1.5 & 3mm) and a 10mm/17mm combination open-end wrench (forged, not stamped) are secured to the inside of the rear cover that requires no tools to remove. The inside of the cover is even labeled with the uses for those tools! (Top) A quality belt drive system transfers the power of the 15-amp motor (Bottom) to the blade. The 15-amp motor (4800 rpm) is stout by any measure, providing the 10" blade with plenty of power for all your cutting needs. Despite the amount of power generated, the motor is smooth and does not lurch on start up. Power from the motor is delivered to the blade through a serpentine-style belt that rides in polished, multi-ribbed pulleys. Serpentine belt drives are common in high-performance race cars because they are exceptionally stable, transmit power efficiently and resist being thrown off of the pulleys. Should the belt need to be replaced (not a frequent event with this style belt), removing four screws releases the cover and exposes the belt for easy replacement. When the trigger switch is released, an electronic brake built into the motor engages and stops the blade in about five seconds. Aside from the obvious safety issues, the brake helps stop the blade quickly before lifting it from the finished cut (as you should always do) to reduce the chance of the blade kicking out or damaging the cutoff piece. (Top) The operating handle can be positioned four ways and has lockout buttons on both sides. (Bottom) Most of the controls are at the front of the machine and easy to operate. One of the unique features of the Bosch 4410 SCMS is the array of front-mounted controls that make using this saw easier and safer. Front mounted controls eliminate having to reach around the blade for many of the most common operations. Having the controls up front also makes accurately setting and locking bevel and miter angles easier. The trigger handle features lockout buttons on both the right and left, one of which must be depressed before the trigger will start the saw. The handle can be locked into four different positions, secured by a hefty metal buckle-style clamp that is easy to operate. The dual lockout buttons and optional handle positions make this saw easy for right or left-handed users to operate in a wide range of situations. Other controls at the front of the machine lock and unlock the bevel and miter angles along with limiting the bevel to the right or left side. In addition, the miter detent trigger (with lock out) and miter locking knob are located at the front end of the table projection. (Top) The small red knob is the fine tuning control, a very handily feature. (Bottom) A adjustable depth control and arm lock are placed at the arm knuckle. The Bosch 4410 SCMS has a very handy fine tuning knob that lets you dial in tiny corrections to the miter angle at all detent positions except 60-degrees, again located near the front of the machine. With this feature the operator can easily make fine-tuning adjustments of up to 2 degrees. This feature is especially useful when fitting molding around a corner that is not as square as it should be. The angle can be adjusted and the corrected angle cut on the saw rather than trying to plane or sand it. There are additional, less frequently used controls at the bevel pivot and arm knuckle points. The bevel pivot has a ¼-turn knob that enables the 33.9-degree (left and right) bevel detents. The arm knuckle has a ¼-turn knob that locks the arm in the down position for transporting. Also, an effective depth stop with push-button coarse and dial-actuated fine adjustments makes partial-depth cuts easy. The Bosch #4410 SCMS is capable of cutting miter angles from 52-degrees left to 60-degrees right and bevels 45-degrees left and right. All of the indicator pointers are adjustable to allow "tweaking" their alignment should that be necessary. The miter scale is angled to be more easily read from the operators position. The miter scale graduations wrap around the front of the table at an increasing slant that makes them easy to read accurately from the normal operating position regardless of the angle being cut. The cast and machined scale markings are crisp and large enough to be read easily, even through my 50-something eyes. Very accurate detents are provided at important angles on both the miter and bevel axis. The bevel scale has detents at 33.9-degrees (left and right), used along with the 31.6-degree miter detents for cutting crown molding (with a 38-degree spring angle) with the molding laying flat on the table. The miter scale has detents located at 0, 15, 22.5, 31.6 and 45-degrees in the left and right scales. Another detent at the 60-degree right scale makes cutting the pieces for a triangle a no-brainer. During in-shop testing, I found all detents to be very accurate, requiring no corrections if the wood being cut is straight. A pair of heavy duty, precision machined steel shafts carry the weight of the sliding mechanism. The Bosch #4410 SCMS features an ultra-smooth sliding mechanism that provides 9" of movement. A pair of 30mm (1.185") finely machined steel rods support the sliding parts which ride on enclosed bearings within the housing. The amount of resistance on the sliding mechanism is externally adjustable. The saw can be converted to a standard "chop" saw by engaging the locking knob at the bearing housing. Table Surface - Here is another area in which Bosch machining shines. The table surfaces are very smooth and perfectly flat, both important for safety and for accurate cuts. Though I used this saw extensively in testing, I never felt that waxing the surfaces was needed. The material moved easily when I wanted it to and resisted movement when held or clamped. (Top) Table extensions on both sides greatly expand the work surface. (Bottom) this trick hold-down clamp works on either side and holds wood very securely. Fences - There are actually two fences per side, one above the other. Both have engraved, unnumbered inch scale graduations in 1/8"-increments. The upper fences are adjustable horizontally, sliding in a track and secured by a knob on the rear of the fence. The upper fences can be removed easily. Both the lower and upper fences have pre-drilled holes for attaching auxiliary fences. Note: Using an auxiliary fence is needed when cutting small pieces like segments for turning bowls and vessels. Table Extensions - Slide-out extensions on each side of the table extend the support surface by 7 ½" per side. The extensions can be locked at any point by a simple lever at the front edge of the table. A flip-up length stop can be moved to either extension, used for making repetitive cuts. Work Clamp - This handy clamp works like a bench dog except that it has a lever handle to lock and release it and a threaded, rubber-tipped disc that can be adjusted up and down to fit the stock. This clamp fits in sockets located behind the fence on both sides of the table. (Top) The dust bag actually gets dust in it thanks to the well-designed dust port (Bottom) at the rear of the blade. thoughtfully shaped port at the rear of the blade. The adapter for the dust bag also fits 2"-diameter shop vac hoses. While it is not perfect, this system actually works very well. I have had to empty the dust bag on the Bosch #4410 SCMS several times already, something I never had to do on my previous miter saws. 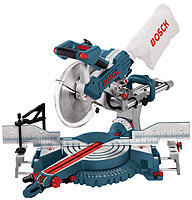 My first impression of the Bosch #4410 SCMS was how much bigger it is than my old plain-Jane compound miter saw. Most of the increased size is directly related to the sliding capability. Though the saw weighs 55 lbs., it is surprisingly easy to move around, using the well-placed built-in carrying handles. All of the movements are very smooth and relatively easy. The slide and plunge motion of the cutting head have just enough resistance to keep the motion smooth but not tiring. The oversized handle gives a solid feel of control but the lockout buttons and start trigger are well placed and easy to operate. The pieces along the blade can be adjusted in or out, acting like a kind of zero-clearance insert. I made several cuts at various angles in scrap to get the feel of the saw and found the feel and operation to be consistently very smooth. Moving the saw through the bevel and miter ranges is easy, as is operating the locking mechanisms that secure the cutting head in whatever position desired. The detents are positive, easily located and very accurate. The Bosch #4410 SCMS came with a 72-tooth, carbide tipped, thin kerf blade that sliced through hard and soft woods easily. The finish on the cut edges was exceptionally smooth regardless of the angles. To test the width capacity, a large piece of plywood was clamped to the table and full length cuts made at various angles and the kerf measured on the bottom surface to get the true through-cut length. At 0-degrees the cut was 12 ¾"-long. At 22.5-degrees 11 7/8"-long and at 45-degrees, 9 1/8". Using whatever scraps I could find, some with questionable edges, cuts were made at most of the detent positions. The results are shown in the photo. Straight 90-degree and normal 45-degree miters, made using the detents with no corrections came out as close as any measuring gauge in my shop can measure. Even standing crown molding up with the flat against the fence produced clean 90-degree corners, necessary when making boxes from this material. (Top) Here are just some of the cuts made with the detents and scale without any adjustments. (Bottom) The crown molding was cut laying flat on the table using the detents with no corrections. It works just as easily for inside corners! Of particular interest was the accuracy of the 60-degree detent. Using a stop block, I quickly cut three pieces that formed a perfect triangle with tight seams that needed no "adjusting." Wood turners will find the 22.5-degree detent particularly useful when cutting segments. I repeatedly cut 8-part rings that fit cleanly without having to sand the ends of 4-piece groups during assembly. I also cut stock crown molding material (the most common 39-degree spring angle) laying flat on the table rather than upside down and angled against the fence as with most miter saws. I set the saw to the 33.9-degree bevel and 31.6-degree miter detents (no corrections) as described in the instruction manual. Both inside and outside corners came out clean and square. When the walls are not perfectly square, the fine tuning capability makes corrections easy. The Bosch 4410 SCMS is an exceptionally well-built tool that will deliver quality performance for many years with minimal maintenance. The built-in accuracy means common cutting jobs are easier and faster. The design and engineering makes this is an easy-to-use machine with a very small learning curve. Up-front controls are very handy, and combined with the rest of the many user-friendly features, make the Bosch 4410 SCMS a highly productive piece of equipment that is safer to operate. Even well equipped shops will benefit by having a Bosch 4410 SCMS on hand. The fast-growing number of home wood shops requiring smaller machines will find that the Bosch 4410 SCMS brings substantial capability without wasting space. If precision compound miter capabilities will benefit your shop, the Bosch 4410 SCMS should be high on your list of machines to consider. Going into this review I was certain that such a complicated piece of machinery would have at least a few things that would leave me wanting. Not so, especially if I am realistic about those expectations. It would be nice if the Bosch 4410 SCMS was smaller and lighter but that is not possible and retain all of the features and capacities. I'd also like dust collection that actually catches all of the dust generated but achieving that on any compound miter saw would require the localized suspension of a few laws of physics, something even the Bosch engineers probably cannot overcome. See our plan for a miter station built around this saw!